The Mishneh Torah, recognized as Maimonides’ greatest work, is the only Medieval-era work that details all of Jewish observance, including those laws that are only applicable when the Holy Temple is in existence, and remains an important work in Judaism. 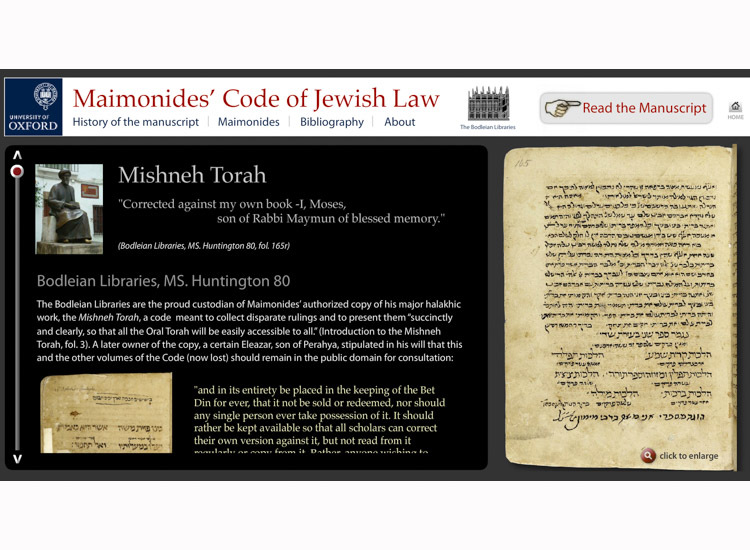 In 1692, the Bodleian Library acquired Maimonides autographed final copy of the Mishneh Torah. The manuscript is signed by Maimonides as follows: “It has been corrected from my own book. I am Moses son of Rabbi Maimon of blessed memory.” The manuscript consists of the first two books of Maimonides’ Mishneh Torah: the Sefer Madda (Book of Knowledge) and the Sefer Ahavah (Book of Love). For the first time, the manuscript can now be consulted, browsed and read online. Using revolutionary technology, Ardon Bar-Hama has captured all the one hundred eighty-eight openings of the manuscripts in high-resolution digital images, allowing readers to zoom in and examine the manuscript in detail.